Several York-Adams athletes earned medals in field events on Friday. Ravaughn Dillard won a state triple jump title last season, but he accomplished two feats for the first time on Friday. The Gettysburg junior won his first District 3 AAA title early in the afternoon at Shippensburg, and his winning jump of 47 feet, 11 3/4 inches set a Warriors school record. Dillard had been tied with his cousin, 2005 graduate Darnell Johnson, for the record after jumping 47-11 at states last season. Dillard trailed Milton Hershey's Treyvon Wheelings by an inch after the preliminary round, but saved his best jumps for the finals. 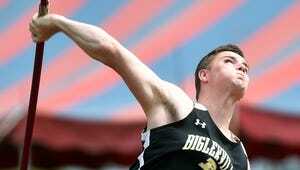 He will compete for district medals in the long jump, where he's seeded sixth, and the' high jump, where he's seeded second, on Saturday. Baddick makes states in girls' triple jump: Dillard's teammate, first-year triple jumper Hannah Baddick, will be joining him at the PIAA Championships next weekend. Baddick earned a seventh-place medal, but her winning jump of 36-9 was good enough to earn her a spot at states. All eight medalists qualified. Grim makes Bermudian Springs history: Trevor Grim stared up at the Seth Grove Stadium football field, quickly calculating whether or not his time in the 110-meter hurdles was good enough to make tomorrow's finals. 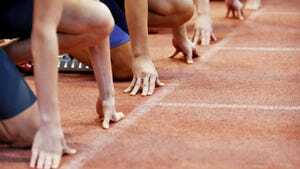 When the Bermudian Springs junior realized his time of 15.23 seconds would in fact be good enough, he sprinted off the field wildly pumping his fist. The result means that he will become the Eagles' first district medalist since the boys team moved up to Class AAA a few years ago. They go back down to Class AA next season. A top-six finish in Saturday's finals will earn him a spot in the state meet. How does he plan to prepare? “Sleep and pray,” he said. Dallastown's Justin Atwood also qualified for the 110 hurdles finals. Eastern's Kerr medals in shot put: Ashley Kerr wasn't expected to win a YAIAA shot put title last week, and she wasn't expected to earn a District 3 medal this week. But the Eastern York junior hit her stride at the right time of the season, setting a personal record with a throw of 37 feet, six inches last week to win the title last week. She came close to that record on Friday, throwing a 37-4.5 to earn a seventh-place medal. She entered the meet as the No. 9 seed. She said she plans to attend a camp this summer to start preparing early for her senior year. Three from YAIAA make 100 dash finals: South Western junior Drew Hartlaub lived up to his billing as the top seed in the boys 100 dash, qualifying for the finals by running an 11.07 in semifinals. He will be joined in the finals by York County Tech senior Bry'quan Sweeney, seeded 18th, who ran an 11.12 in semifinals. New Oxford's Ayanna Johnson qualified for finals in the girls 100 dash by running a 12.43 in semifinals. In the girls 100 hurdles, South Western's Lynne Mooradian qualified for the finals with a time of 14.92, the second best time of any competitor in semifinals.